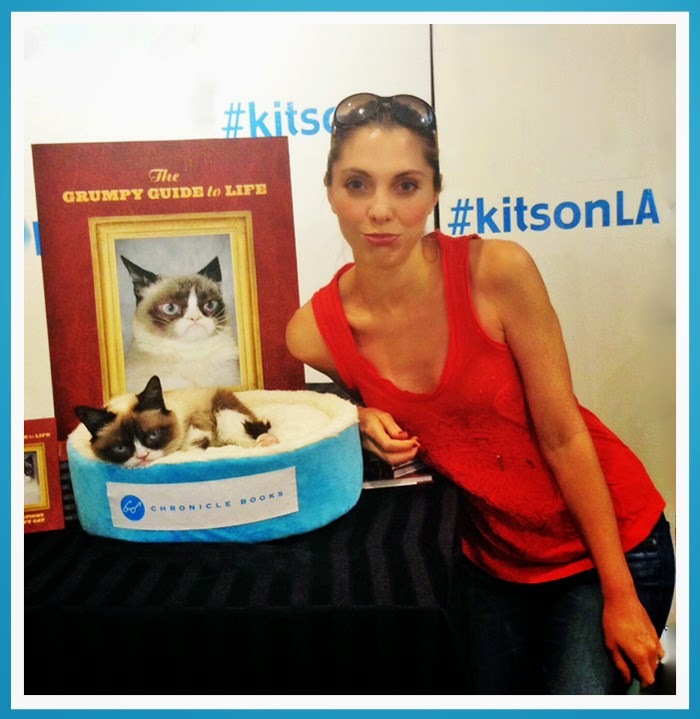 That Time I Met Grumpy Cat. Fun Fact: Grumpy Cat has a real name, it is Tardar Sauce! Yup. Santa Monica. It was nearing sunset, on a busy Monday. I waited in a very long line with my wristband, but it was all worth it to see GC in person, er, in kitten. Even if she was sleeping for most of the visitors.. sleeper..
And then her eyes popped open! I like to think just for me. 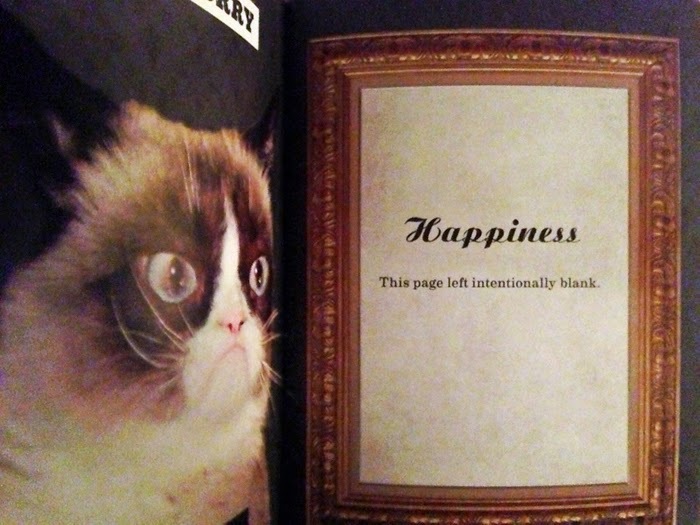 Grumpy Cat's book is highly advised. I read the whole thing tonight and giggled the whole way through. Perfect gift for someone you love, grump over or for yourself! snapshot from the pages of my copy of Grumpy's new book.. So I waltzed over to Kitson, perched myself in the long, winding line at Santa Monica Place and awaited my turn. It was mind-boggling to see hoards of people show up for one little kitty cat. (Kitson said they expected to allow 1000 people through to meet GC). There was a woman wearing cat ears and a Grumpy Cat T-shirt that exited the store early on after meeting GC. She was fanning herself with the book with a giddy excited smile on her face, muttering "omg omg omg" to her friend. Then there was a girl wearing a full on GC dress. A girl wearing Grumpy Cat print leggings. And many teen girls wearing cat ears. There were a few older folks clutching books in their arms. A press crew of some sort interviewing people in line, asking them to make their best grumpy face. 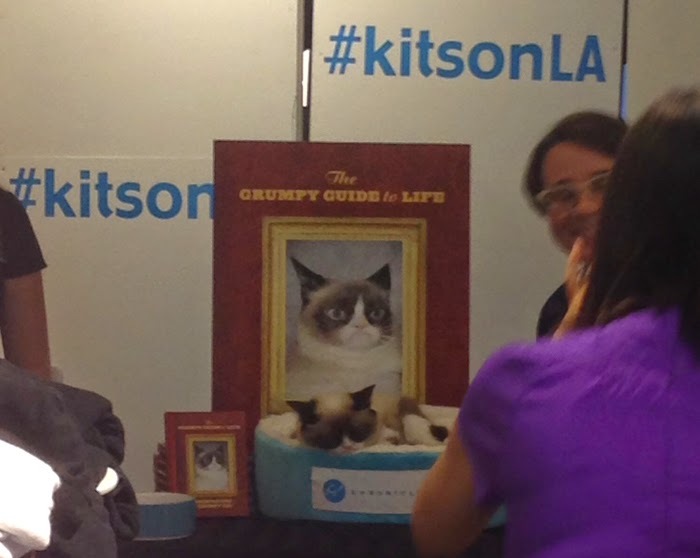 And overall the Grumpy Cat fans in line looked more giddy than grumpy. I guess we all left the un-cheer and grumpiness up to the queen of grump herself. And yes, Grumpy Cat is a "she" even though I heard several people say "he." I restrained myself from correcting them all. About half-way through the 90 minute line wait, we noticed people exiting saying "she was sleeping." As if they were sad that she wasn't running about the Kitson store spreading grumpiness and prancing her paws in a grumpy frolic. As if they were surprised Grumpy Cat was grumpy. How ironic. And lets not forget that this is a kitty cat folks. If you own a cat, you know that they basically do four things in life, sleep, eat, bathroom and play. And the sleep part of that pie chart is giant. 1. No touching or petting Grumpy. 2. No flash photography, turn your cell flash off. 3. You get one photo per person per wristband. That's it. One shot at this guys. The woman taking the photos was fast. Grab cell, head up to Grumpy Cat and pose. Literally each person had about 5-9 seconds of glory with the famous, superstar furball. I prepped my phone and waltzed up to the throne. Observation #1: Grumpy Cat is TINY. She is a dwarf cat, but that doesn't even describe it. She is like a little bunny rabbit. Observation #2: Soft fuzzy fur. Bunny fur. It was incredibly hard not to give her a snuggle. Observation #3: Grumpy Cat may be grumpy, but she was making everyone quite giddy with happiness. Sorry Grumpy. Observation #4: Yup, she was sleeping. Like, head burrowed into the bed, eyes closed, out like a cat, sleeping. And there was nothing any of us could do about that. My photo op. I leaned into the shot and the fans looking on, still in line, all started to giggle and say "Awwwww!" I guess because suddenly Grumpy's little head lifted and wiggled a bit and her sparkling clear blue eyes opened up. JUST FOR MY PHOTO. But I had no idea. I basically prepared myself for a fuzzy dull photo. I later looked at my shot and saw that her little eyes were open and sparkling up at my cell phone. Perfect. Success! Upon exiting the store, I received an ink paw stamp inside my Grumpy Cat's Guide to Life Book. I was on a cloud of happy-grumpy air. Then I Instagrammed. Of course. And tweeted. And in an hour or so noticed that Grumpy RETWEETED and followed me. I die. Overall, I was shocked how starstruck I was by a little kittay. :) But I guess she is famous for a reason. That Grumpy Cat charm and charisma is one in a billion. Purr. 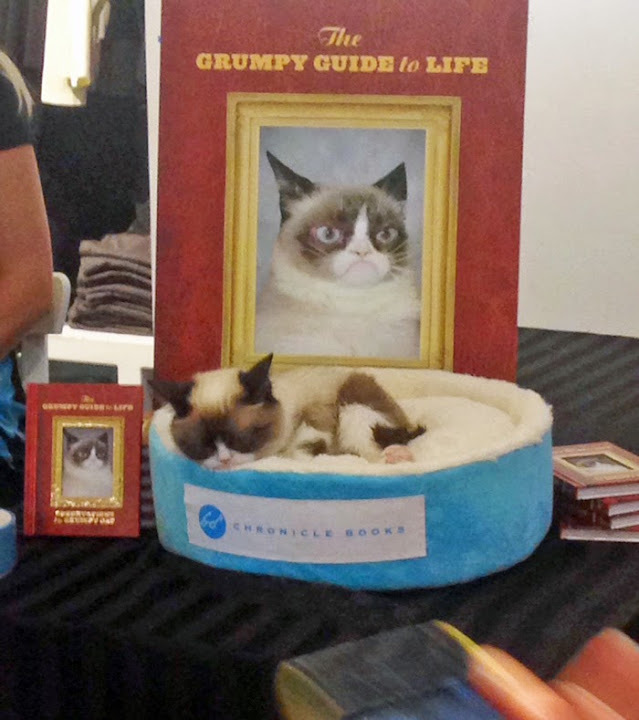 Also, Grumpy Cat's book tour has a few more stops in NYC, Vegas and more. Get the schedule on Grumpy Cat's website. "Grumpy Cat became an internet sensation after her photo was posted on Reddit on September 22, 2012. It was suggested that the original photo was photoshopped, so we posted a few videos on YouTube. The videos went viral and her popularity has continued to increase! Tardar Sauce visites the vet regularly and she has a clean bill of health. Her petite size and famous face is likely due to feline dwarfism and her rear end wobbles a bit when she walks due to this; otherwise she is a perfect little kitty! She is not a munchkin cat and was not bred purposefully from other munchkin cats. (We don’t breed kitty’s and her parents are normal sized domestic short hair cats.)"